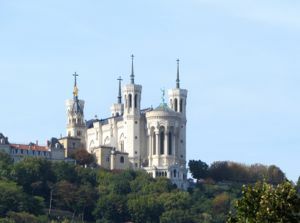 Lyon has many churches that represent a range of history and architectural styles. Vieux Lyon was built around three parishes: the Cathédrale of St-Jean in the middle; St-Georges to the south; and St-Paul to the north. The Cathédrale St-Jean (map) is today the heart of Vieux Lyon, and its busy parvis is always active. 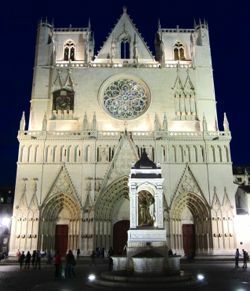 The cathedral is a combination of Romanesque and Gothic architecture, with the main section being built between 1160 and 1380. It has been cleaned many times and today gleams white, though traditionally it would have been painted. In 1600, the Cathédrale was the site of the marriage of King Henri IV and Marie de Médicis. 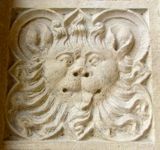 Its facade contains many small carved medallions, including a lion's head that has come to symbolize the Renaissance du Vieux Lyon Association. St-Jean also has a historic astronomical clock that dates from the 14th century. Long an attraction for visitors, it unfortunately was damaged by a vandal in 2013 and is in need of repair. You can still see the exterior of the clock, but it is not functioning. To the south of St-Jean, the smaller St-Georges Church with its single spire sits at the end of the Passerelle St-Georges (footbridge, one of several across the Saône connecting Vieux Lyon with the Presqu'île). Over its doorway is a sculpture of the familiar scene of Saint George slaying the dragon. To the north is the Church of St-Paul, just across from the local train station of the same name. Like St-Georges it has a single spire, and is the least visible of the three churches. Towering above them all is the Basilica of Notre-Dame de Fourvière (map), built in the late 1800s on the site of the Roman Forum. The Basilica interior is very ornate, with golden mosaics, paintings, and opulent decor. Although some Lyonnais feel it is overly decorated, it does have a harmony of style since it was all designed by one architect, Pierre Bossan. Next to it is a Museum of Sacred Art. The Virgin Mary is said to have saved the city from a cholera epidemic, and the original plan was to dedicate a statue of the Virgin with a candle light ceremony in 1852. Torrential rains prevented that from happening, but all over Lyon people spontaneously lit candles in their windows. This became the Fête des Lumières, held in Lyon each December 8. Today, creative lighting displays are found throughout the city, lighting up the darkness. Below, Basilica of Notre Dame de Fourvière.